2019-03-18 8:30am, X5105, G5RV, SSB, 5 watts, 618 miles, WA4THR, East Coast Amateur Radio Service, S6 report, he was 59+. That's the fun of QRP! 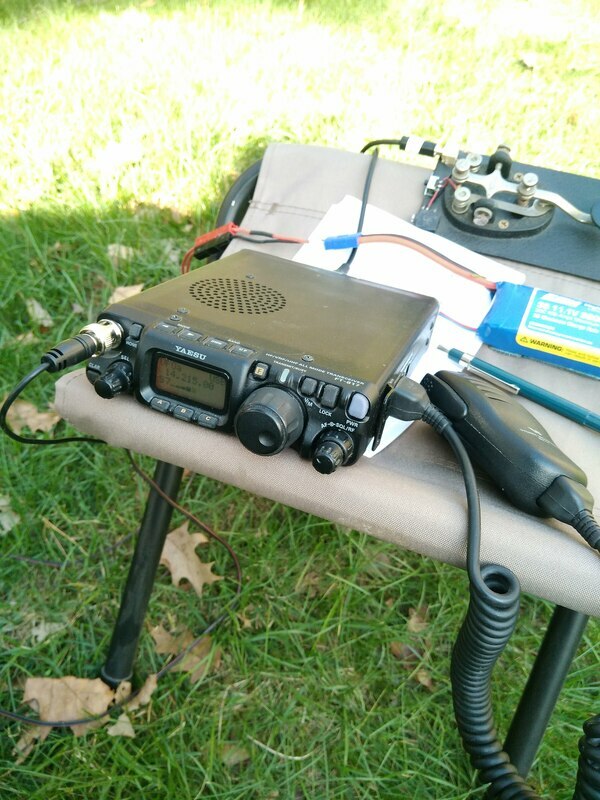 2019-03-05 Like many hams I've played on and off with QRP for many years. And much as I hate to admit it, for many of those years I thought QRP was sort of the "lesser" side of radio. For those who couldn't afford better, or something similar. But over the past couple of years and particularly from my experiences of the past six months or so, I've changed my tune. I've almost flip-flopped! QRP may just the "great" side of radio. It challenges and rewards in ways higher power simply cannot do. I haven't sold all my 100 watt rigs and don't plan to any time soon. But they get much less operating time now than in the past. Here are some of my current thoughts on why the change in my thinking and behavior? Here are some thoughts on the matter. QRP is not necessarily easy. You don't make a contact every time you pick up the mic or pound the key. It takes patience and persistence. My CW contact with a station in Puerto Rico recently with my x5105 and DIY magnetic loop probably took at least a half hour as he was pounded by stronger signals. But each time he ended a QSO I sent my call. And when he finally had a bit of a lull and sent out a CQ he heard me and came back immediately. I was surprised at his 579 report as my S meter showed him 559 here. But he was solid and we had a solid QSO. On the other hand the QSO with a station in Maryland that same time was easy to get initially but signals faded almost as soon as we made contact. It was a struggle but we got the essentials across. QRP is rewarding. Most of the time the thrill of "getting him" is much greater at 5 watts than when I fire up my IC7100 and G5RV and call or answer CQ and connect, even with 25 watts which is my normal power level. The QSO with KP4SJ at 5 watts with my small mag loop antenna was a lot more exciting than the one I had a week earlier with KP4RP using 50 watts and my G5RV station antenna! And that is probably one of the main reasons I like playing with QRP. It just gives me a greater sense of accomplishment! That makes the time involved worth while. Upper Left to Lower Right: FT-871nd in the back yard. 2018 Field Day. 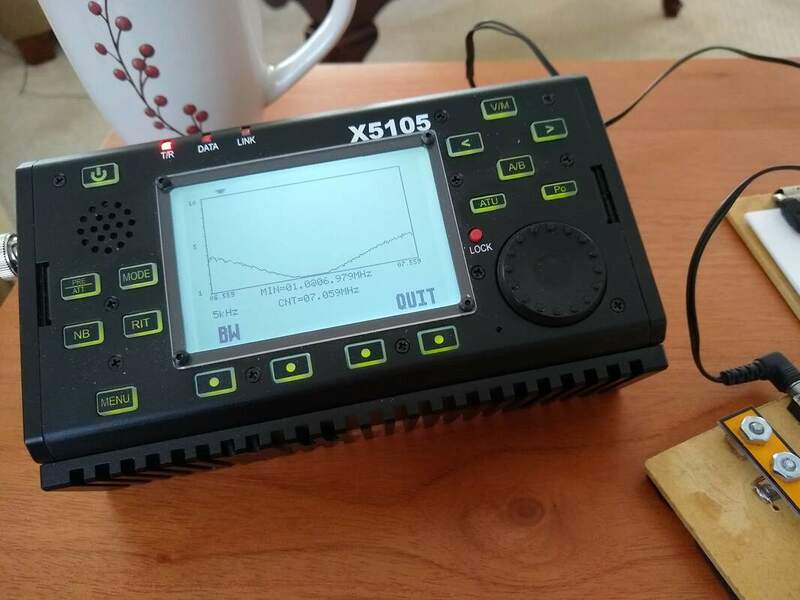 Xiegu x5105 antenna analyzer. 4-States QRP kits. Wolf River Coils Silver Bullet 1000 TIA antenna, x5105 station on dining room table. QRP needs to be intentional. If I only have a short time to play radio, I'll usually fire up the base station, pick up the mic or key, tune around and answer a CQ or call CQ and within a fairly short time have a QSO. It's quick and easy which is what I want at those times. I have to make a conscious decision to use my QRP gear because I know it will be "more work." Especially if I want to use one of my portable antennas like the mag loop or trapped inverted vee, or even the Wolf River Coils vertical. They have to be set up so it takes some time up front. I also know that spending an hour or so with no contact is not uncommon. But I also know that snagging that contact with a station in Germany, France, Puerto Rico or even contacting a SOTA or POTA station (or sometimes with anyone!) will be worth the wait! In fact after such a contact, I often just put down the mic or key, go get a glass of water, eat a cookie and just savor the success! I don't need many QSOs to feel rewarded! 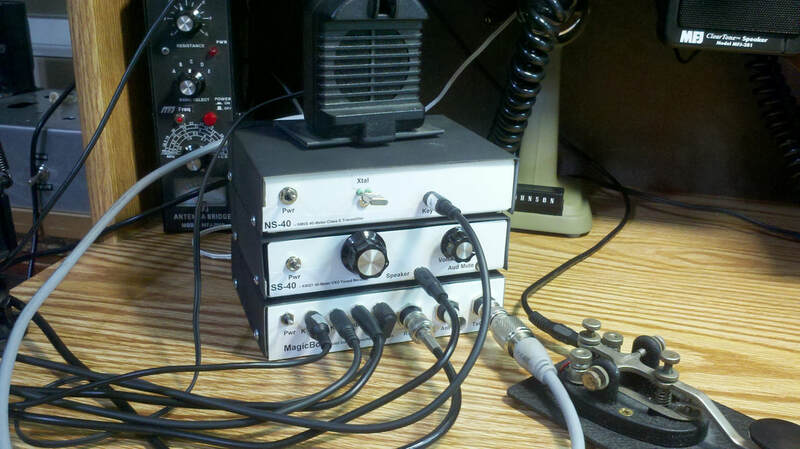 QRP also lends itself to experimenting, especially with antennas. At QRP power levels everything can be light weight and easy to handle. I've gotten into "stealth" wire antennas. A link inverted vee can weigh almost nothing and take up very little space. Weighing even less and being more compact is a trap inverted vee. Push-up fishing poles can make deploying an end fed or inverted vee antenna very easy and quick. And you can put it up almost anywhere. You don't need to throw ropes and wires into trees and all that stuff. Coax feed line can be light. I like RG174. A 25 ft bundle takes up almost no space and weighs just 4 ounces yet does the job very well. QRP makes portable operating simple and fun. For years I had a Yaesu FT-817nd. I didn't use it out doors much apart from Field Day each Spring. In August I got a xiego X5105 HF-6meters QRP radio. It has had me in the back yard a lot this past late Summer and Fall. Its internal high capacity battery, auto tuner and antenna analyzer function make it perfect for portable use. In fact it inspired me to spend weeks building and improving portable antennas. Once the weather warms up I plan to take the x5105, along with one or more of my portable antennas and head to parks and woods in our area and just play radio! The whole package will fit into one or two small bags weighing just a few pounds. Can't wait! And, by the way, portable doesn't mean ONLY out in the wild, by a lake or in the woods or at a park. 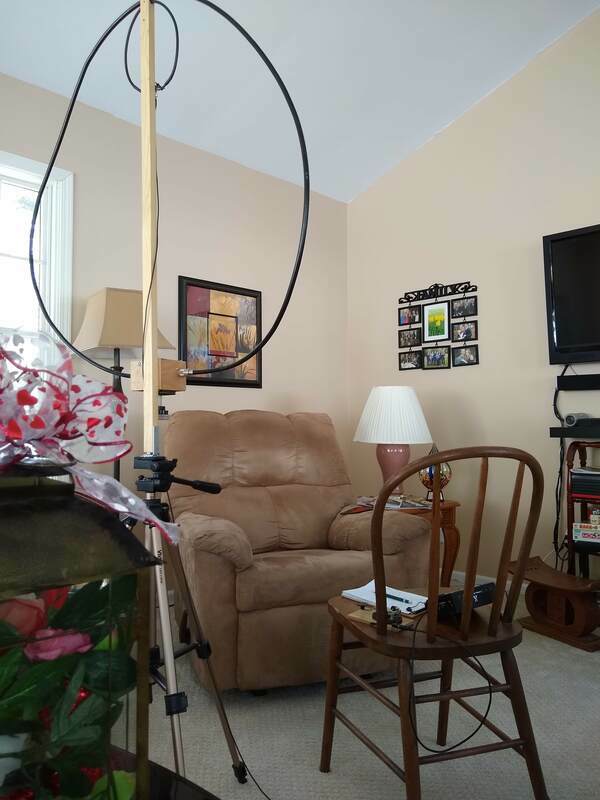 When the weather is bad, take your QRP gear to a room in your house where you don't normally operate, set up a portable antenna, use your battery power and give it a try. 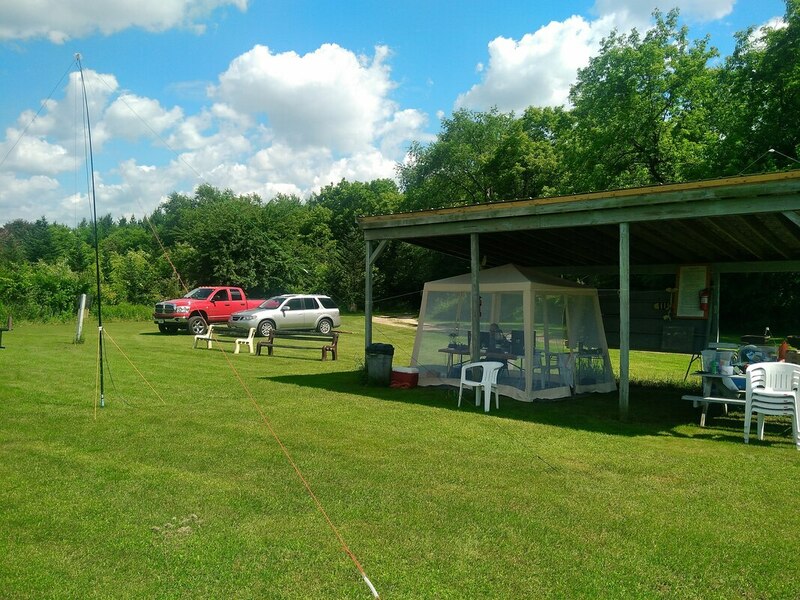 From our living room here in Wisconsin I recently enjoyed a 20 meter, 850 mile CW QSO with a station in Mississippi! We were both 559. I was using my x5105 with internal battery and DIY magnetic loop. It was 02/09/19 about 9:00am. Same setup I might have used outside, had it not been near zero F with snow and ice all around. So, my encouragement is, turn off the higher power rig now an then. Turn on your QRP rig and commit to sticking with it for a while. When I got the x5105 I decided to use it exclusively for a while. That "while" lasted nearly three months! Seventy percent of my QSOs during August, September and October this past year were with that x5105! I not only enjoyed it but enjoyed "bragging" about it to my QRO friends! In fun, of course! It was fun and rewarding and I now understand that rig front-to-back as well as a lot more about QRP operating as a result. So Go For IT. You'll be glad you did. A great resource for operating QRP is the book Minimum QRP by vk3ye. He takes a very practical approach to many of the issues one must deal with to operate QRP. 2019-03-02 Yesterday evening I had a few minutes so I fired up the x5105, tuned up my G5RV and tuned around. I had two objectives, first was to get out of the SKCC portion of 40 meters (around 7.055) and have a QSO using my little Whiterook Products Model MK-44 mini iambic paddle. Since I almost exclusively use my straight key, I need to get more comfortable using a paddle so I won't get all tangled up and send garbage! The second objective was just to have a QSO! After tuning around I couldn't find anyone calling CQ or ending a QSO in a timely fashion so I decided to call CQ. In his book Minimum QRP, Peter Parker, vk3ye, states, "Getting non-arranged contacts... especially if they're answers to CQ calls, is a good sign of success." I wanted success! After five or six calls KK4GEE near Atlanta came back. He was solid but not strong so I wondered how the QSO might go. It went well. We were both 559 and were both QRP! Our ten minute rag chew QSO was really fun and ended my day successfully! And my little mini paddle and I got along pretty well with only a few garbled seconds! Whiterook Products MK-44 Iambic Paddle and X5105. Oh, and a third objective is to see how long my new Bioenno Power 4.5 Ah battery will last! My excuse for getting it is preparation for the upcoming Field Day in June. You can see partially in the above photo, the bright blue thing in the upper left corner of the photo. I'm not working it very hard so not sure I'm learning much, but it is an excuse! Since the internal battery of the x5105 is about 3.9 Ah this slightly more than doubles my battery capacity. 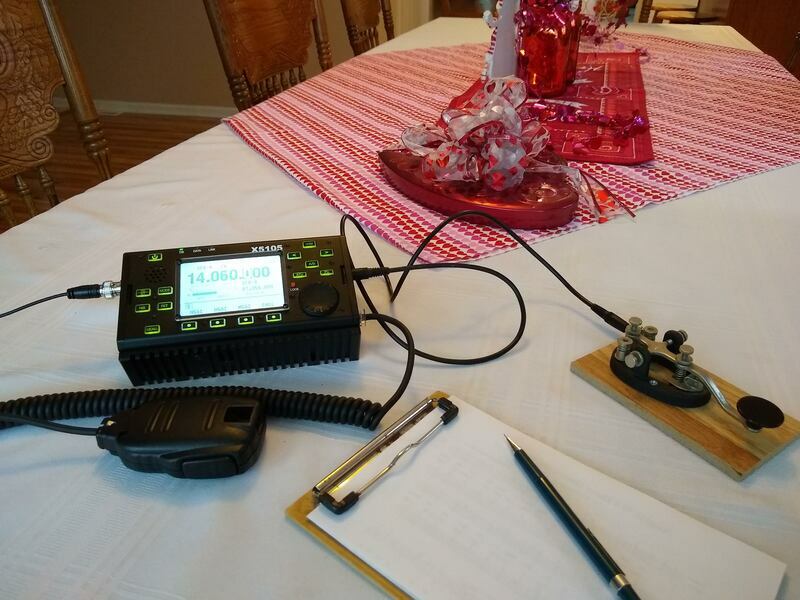 2019-02-12 I just can't quit playing with my QRP radio, the x5105. Oh, I use my QRO rig too, usually at about 25 watts, but it's not the same. The thrill of a QRP contact is addictive. Yesterday I tuned up my G5RV on the x5105 and very quickly had a QSO with WB2DHY 650 miles away in Virginia on 40 meters, mid day. He gave me a 559 and he was 579 in here. In the course of the QSO I learned he was running 1kw into a vertical! Granted it was an easy to copy signal but I was more than proud of my 5w and G5RV! Then about a half hour later, on 20 meters I heard VA7JC 1700 miles west in British Colombia calling CQ so I answered him. He gave me a 529 and he was 569 in here. We chatted for just under ten minutes and were solid copy both ways! Thanks Jon for hanging in there with my S2 signal. You made my day! I ended the day with two other QSOs, one on 20 meters and the other on 30 meters, 800 and 600 miles respectively with solid copy on both. That's why I keep coming back to QRP. I could probably have had twice that many contacts in the same time frame on my main rig with 25 watts. But in comparison to these four, it would have felt kind of "utilitarian" instead of invigorating! Of course it would have been even more fun had I been using my magnetic loop or the Wolf River Coils Silver Bullet 1000 TIA! So I compromised a bit! Maybe today, though the 7 inches of new snow will probably rule the Silver Bullet out! 2019-01-31 I just completed five QSOs with stations in Puerto Rico (2140 miles), Colorado (900 miles), West Virginia (530 miles) and Maryland (630 miles). The Puerto Rico and Colorado contacts were between 2:00pm and 3:00pm on 20 meters. The other three were between 5:00pm and 6:30pm on 40 meters. All were CW and all were made using my DIY magnet loop sitting on my camera tripod in the middle of the living room! I used my Xiego X5105 for all of them. Looking through my log I see that I logged 173 five watt QRP QSOs since January 1st of 2018. 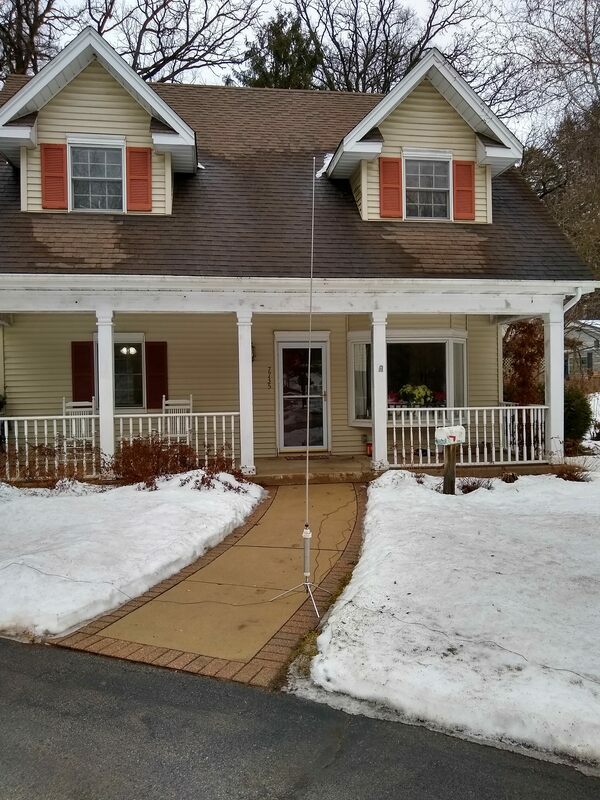 For antennas I used a DIY trap inverted vee (58), my home G5RV (53), a 35 ft end fed wire (50), a link inverted vee (11) and one on a fan inverted vee. The most distant contact was with DJ5MW in Germany (4400 miles) using my G5RV antenna. Twenty four of them were distances of greater than 1000 miles. DIY Magnetic Loop setup for the Puerto Rico QSO mentioned in the text. Indoor Portable... When it is about zero outside with snow and ice, set up inside! You'll be surprised how much fun it is. 25 ft length of RG174 coax, perfect for my QRP operation. Weighs just 4 oz.